Pipe Stone has been used by Native Americans for thousands of years to make the pipes for which it is named. Pipe stone comes from southwestern Minnesota, and is quarried in several traditional quarries that have been in used for the past 3000 years. Indian Tribes from all over North America still travel long distances to these sites to continue the tradition of pipe stone quarrying and pipemaking. The 54 active quarries can only be used by permit issued from the National Park Service. These permits are only issued to members of a federally recognized indian tribe. Pipe stone is still mined today using very similar methods as were used in ancient times. Hand tools and wheel barrows are used to remove top soil and a thick layer of quartzite (one of the hardest stones in the world), to reveal the narrow downward sloping vein of red pipe stone. The quarries are located in a bowl shaped depression that collects water during the spring rains so most of the quarrying is done in late summer through early fall. Our Fourth run of pipe stone consists of four different engravings: three d20s in our Standard Engraving, three d20s in our Ptolemaic Engraving, three d20s in our Kanji Engraving, and three d20s in our Runic Engraving. 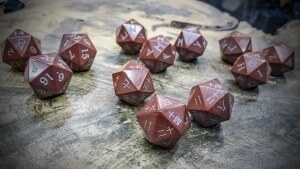 Do these come in sets of 3 or just one D20? these dice are beautiful, but how brittle are they? Please do another run of this stone.